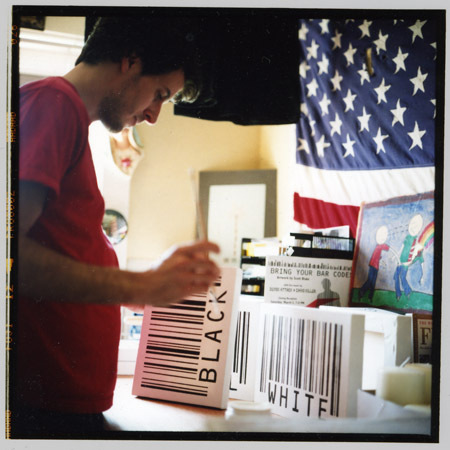 Scott Blake takes barcodes and turns them into art — art that is simultaneously pop and op, intellectual and personal, minimal and ocular. Blake uses the black and white icon of our data-drenched existence to stimulate thought on topics from consumerism to religion and individual identity. His merchandise urges the viewer to consider the limitations of digitized human expression and appropriate these symbols of commodity. Shirts, Tattoos, Dog Tags, Baby Bibs, Money Buttons, Patches, and Arm Bands. Coffee Mugs, Koozies, Wallets, Stickers, Postcards, and Magnets. Tattoos, Dog Tags, Shirts, Baby Bibs, Coffee Mugs, Paintings, and Magnets. 9/11 Flipbook, Barcode Flipbooks, 5X8 Zine, O! Public Art Booklet. New York, London, Paris, Milan, Chicago, Melbourne and beyond. Minor printing errors, discontinued editions, or test prints.